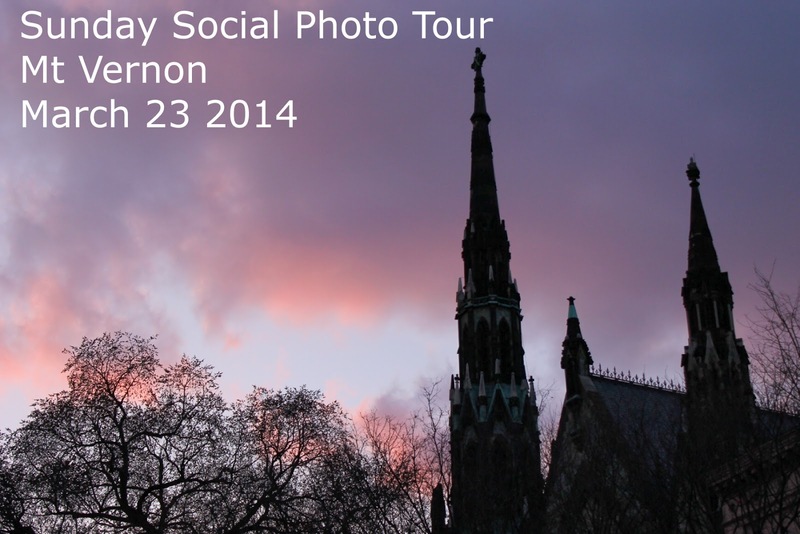 Our 3rd tour on Sunday, March 23rd was overcast and chilly, but 8 brave photogs joined us on a trek around Mt Vernon. Overcast days are good for shooting outside; the clouds works as a natural diffuser for the sun so there are few shadows. We met at a coffee shop on Charles Street to go over photography basics including the exposure triangle, metering and focusing and white balance. After a half hour or so, we moved outside to start the tour, shooting on Aperture Priority. Our first stop wasn't really a stop at all. To reinforce the concept of light metering, mainly where to meter if you are in a situation with different levels of light, we shot some buildings across the street with the bright white sky behind them. They also practiced changing their focus from foreground to background. We used the hypothetical situation of trying to capture a friend in front of a building when the light is behind them creating a silhouette. After spending a bit of time there, we moved on,heading south on Charles Street. We stopped at the building at 1111 N Charles Street, which has a beautiful facade and a raised courtyard out front. There were also some skateboarders nearby who were practicing tricks and rail slides. The attendees wanted to try to capture the skateboarders, but they were moving pretty fast. I had everyone switch to Shutter Priority and explained two types of captured motion: Freezing an object and implying motion in the object. To freeze an object, we used some flags that were nearby. I showed them the difference between shooting the flags with a shutter speed of 1/400 VS 1/20. The faster speed stops the motion, while the slower speed shows a blur where the flag had waived. We also used my assistant Shane to capture movement. I explained how to ban a subject with a slower shutter speed, to get them in focus and the background be a motion blur. Shane and I walked back and forth in front of attendees as they panned. Once they practiced with slow moving us, they tried to capture the skateboarders as well. We moved down Charles Street to stop at The Belvedere Hotel. I asked the front desk person if we could shoot inside for a bit, to warm up. The lobby had tons of interesting objects, from chandeliers to posters to floral arrangements. We discussed the concept of frame filling images. When shooting something pretty and large, but you just can't get an angle that is interesting, zoom in so there is nothing in your frame but that object. We worked our way down to Maisys for some light fare, drinks and to warm up again. This gave us a chance to review attendee images so they know what to work on for the second half of the tour. Back outside, we moved to the Washington Monument just in time for the golden hour of light. The clouds cleared and the buildings were cast in a beautiful gold. The sun going down also gave us another opportunity to practice metering and moving stops to get more or less light in the images. All taken at the same time of day. Finally, we moved up Charles Street a bit, to where the road split around the monument comes back together, to practice light trails and capturing movement of cars. Because it was darker out, there were more challenges such as keeping the camera as still as possible without a tripod.